Finite Element Analysis and Computational Fluid Dynamics have been introduced in modelling and simulation of drying and storage systems, these techniques are expected to dominate the future research and development of drying and storages, and should reduce losses and improve the quality of agricultural products, enhancing food security globally. 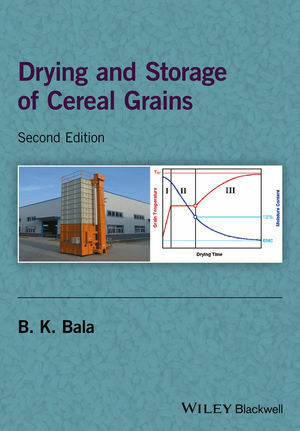 Drying and Storage of Cereal Grains, Second Edition, covers the wide spectrum of drying and storage methods applied to economically important cereal produce, providingnumerical examples for better understanding the complexity in drying and storage systems through modelling and simulation, aiding design and management of drying and storage systems. Chapters 1 to 8 look at air and grain moisture equilibria, psychrometry, physical and thermal properties of cereal grains, principles of air flow, and provide detailed analyses of grain drying.Chapters 9 to 13 focus on temperature and moisture in grain storages, and provide comprehensive treatment of modern grain storage systems. The book also includes a number of unsolved problems at the end of each chapter for further practice. This book will provide students in agricultural engineering and food engineering with a wide spectrum of drying and storage studies previously unavailable in a single monograph. It will also serve as an excellent reference for practicing agricultural engineers, food engineers and food technologists. B K Bala, Department of Agro Product Processing Technology, Jessore University of Science and Technology, Bangladesh.